I had the the opportunity last Thursday night to attend the kickoff of the Holiday Light Festival in Griffith Park — a night dedicated solely for cyclists. I arrived via Metro Bus 96 from Downtown L.A. after work and there I found a gathering of cyclists and their families ready to be the first on two wheels to experience this year’s LADWP-sponsored event. Los Angeles City Councilman Tom LaBonge was there to promote the event. He told a burgeoning crowd of cyclists and news reporters that he wished every night was Bike Night and that he could do more for bicycling in the city. He then gathered with helmeted youngsters to officially “flip the switch” to turn on the mile-long light display. I joined a procession of cyclists who then bobbed and weaved down Crystal Springs Drive toward 26 light displays as television cameras and photographers whirled around us. I was suitably impressed, but the experience by bike was over too quickly! Don’t get me wrong. I enjoyed the twinkle of lights passing my eye, the brittle night air and the piped in holiday music wafting over the loudspeakers. But sometimes a bike’s speed and efficiency can be too much of a good thing. That’s not a problem that car drivers will likely encounter. I’m sure they’ll have plenty of time stuck in traffic to see the displays. They’ll get their chance from Dec. 18 through Dec. 30 on the festival’s driving nights. In the past, this was pretty much a car-only event but with concerns about traffic growing, the light festival has greatly increased the time that it’s open to only pedestrians or cyclists. Pedestrians have their opportunity to view the light displays from now until Dec. 17. Just park at the L.A. Zoo and take a free shuttle to the display. Or better, yet, take public transit. 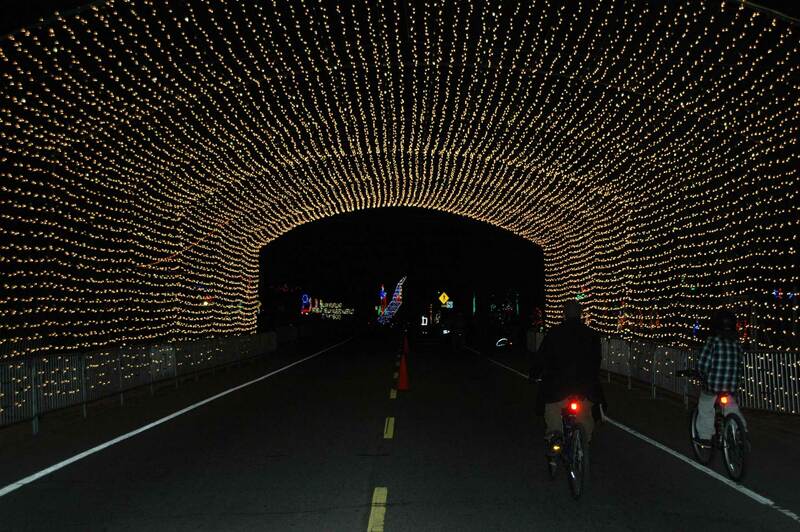 Cyclists do have another chance to enjoy the light festival if they missed Bike Night. Mark your calendars now for December 21 and 28 — both Mondays. On both evenings, cyclists have the road to themselves between 5 and 5:30 p.m. While that may not seem like enough time to enjoy these displays by bike, it will be — trust me.